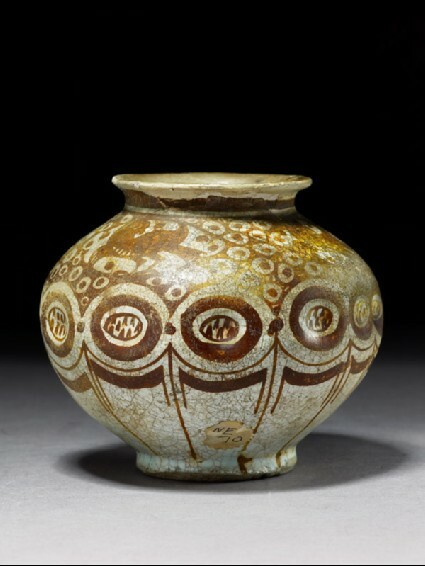 First seen in ninth-century Iraq, lustreware became popular in Fatimid Egypt (AD 969-1171), the period to which this jar can be attributed. Unlike lands to the east, Egyptian lustreware included naturalistic designs in its decorative repetoir. Animals, real or composite, and birds, were popular motifs, and were often executed with remakable spontaneity. Some of the most sophisticated examples of lustreware were also decorated with fine human representations, including Christian subjects, suggesting a broad market for this type of luxurious ceramics.